Click Here to Begin Slideshow Out of sight. Out of mind. That often describes braking systems perfectly. The funny thing about brakes is that you usually don’t worry much about them until you really need them. If something like a jack-knifed semi blocks your path as you crest a hill, and as you get on the brakes, they start to fade, you just know there’ll be a pretty big sphincter factor quickly approaching. 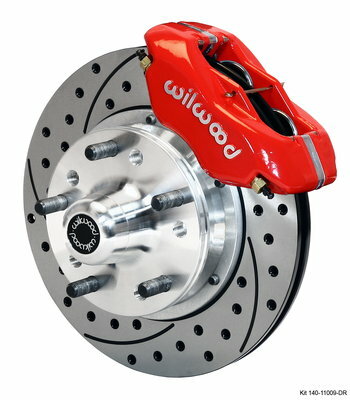 At that point, brakes are without question the most critical components found on your car. Hauling a hurtling 3500-pound car down from warp speed is a big, big job. And making that 3500-pound projectile stop in as short a distance as possible is an even bigger task. You can’t (and shouldn’t) treat brakes lightly. That’s why we poked and prodded and came up with an extensive brake tech tip series. What follows are fifty tips devoted exclusively to car brakes. 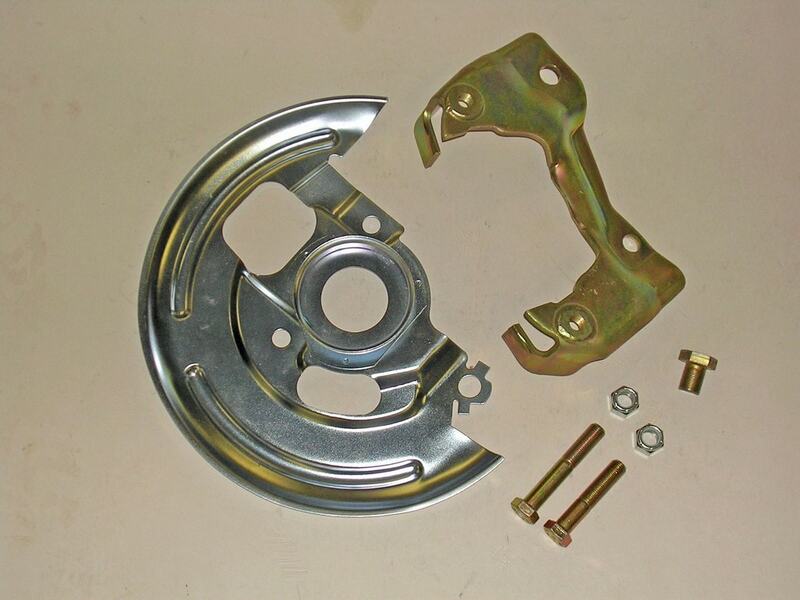 Some of the tips are easy maintenance “fixes.” Others are more tuned to designing and building custom brake systems. Check out the following. There’s something here for everyone, and we’re positive you won’t regret it. Out of sight. Out of mind. That often describes braking systems perfectly. The funny thing about brakes is that you usually don’t worry much about them until you really need them. If something like a jack-knifed semi blocks your path as you crest a hill, and as you get on the brakes, they start to fade, you just know there’ll be a pretty big sphincter factor quickly approaching. 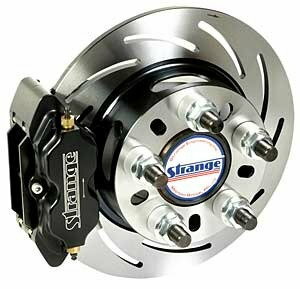 At that point, brakes are without question the most critical components found on your car. Hauling a hurtling 3500-pound car down from warp speed is a big, big job. And making that 3500-pound projectile stop in as short a distance as possible is an even bigger task. 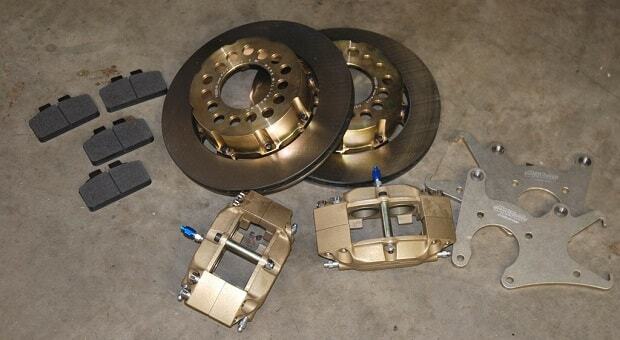 You can’t (and shouldn’t) treat brakes lightly. That’s why we poked and prodded and came up with an extensive brake tech tip series. What follows are fifty tips devoted exclusively to car brakes. Some of the tips are easy maintenance “fixes.” Others are more tuned to designing and building custom brake systems. Check out the following. There’s something here for everyone, and we’re positive you won’t regret it. When you shop for a master cylinder, two details are very important: The piston bore dimensions and the location of the outlet ports. According to Wilwood, many master cylinders (including those for countless late models with power brakes and anti-lock brake systems) have the outlet ports on the “wrong” or engine side for something like a custom build. This obviously makes plumbing difficult, or impossible, particularly in applications where the master cylinder is firewall mounted. In contrast, those same master cylinders that are “wrong” for a firewall system can be absolutely perfect for a floor mount assembly. There’s more, though: Some master cylinders are not well suited to non-power boosted vehicles (for example, a typical bad-to-the bone car with minimal manifold vacuum). Why not? Simple. Some are configured to work with a healthy mounting angle, which mandates a wedge-shaped firewall adapter. So what’s the answer? When it comes to swapping, take a close look at the Mopar master cylinders commonly used in many drag race applications. 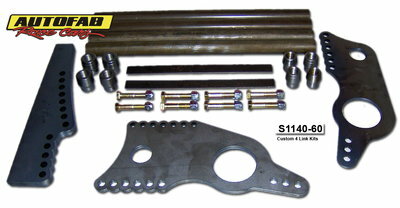 They’re perfect for many modified (street-driven) applications. Both Mark Williams and Wilwood point out that at least two bore sizes are readily available – 1-inch and 1-1/8-inch (a 1-1/32-inch job is also available, but this setup is very close to a 1-inch bore master, and it’s sometimes labeled as such by various vendors). 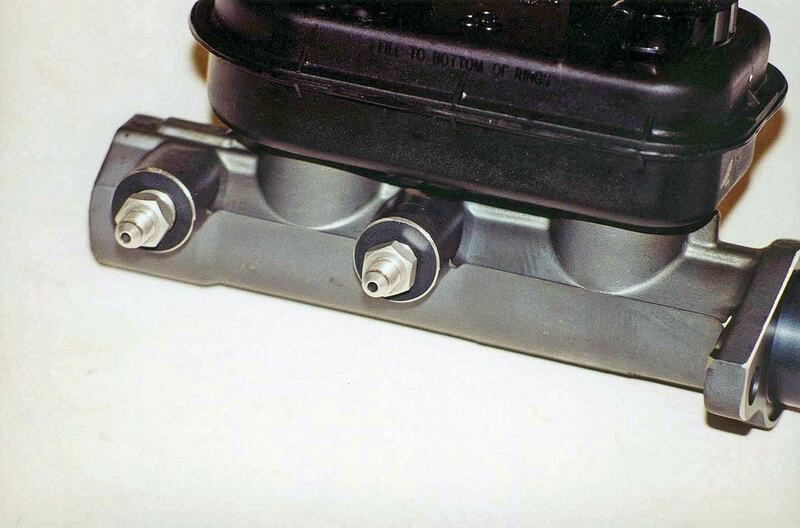 By the way, these Mopar master cylinders are manufactured with an aluminum body along with a relatively large capacity plastic reservoir with dual outlet bores. And those outlets correctly face the drive side fender when hung on the firewall. OK - the Mopar master cylinder is, quite honestly, the darling of the modified, production-based passenger car crowd. It’s definitely small. It’s definitely light. It looks good, and the ports are properly oriented for firewall mounting. But there’s one itsy-bitsy quirk: The size of the outlet fittings is, to put it bluntly, goofy. The front fitting is a 9/16-20 Inverted Flare while the rear is a ½-20 Inverted Flare. Typically, you won’t be able to find applicable adapters at Bob’s Corner Auto Parts store either. In fact, a search will likely drive you nuts. A better alternative is to contact Lamb Components (Upland, CA). 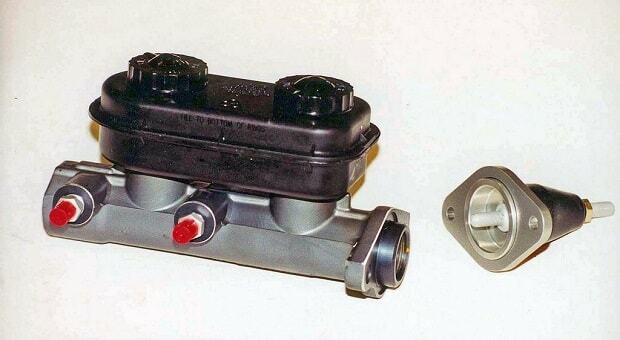 They manufacture special #3 A-N male adapters specifically for these master cylinders. The part number is 1050 for the ½-inch fitting while the 9/16-inch job is part number 1051. And by the way, they also have banjo fittings in the same size for both master cylinder port sizes. Save yourself some agony – call the folks at Lamb and buy the parts. They’re not really brakes, but they’re close, related and something you should inspect carefully when performing a brake job or replacing major hardware: Take a look at one of the drum brake spindles we peeled out of an original 36,000-mile car. It doesn’t take a rocket scientist to see the flaw, nor does it take much imagination to imagine the carnage had the spindle decided it was time to break. We can’t believe our luck, either - we unknowingly drove the car over the Rocky Mountains in stock form with this not-so-small problem. And we survived! Bottom line here is to check it twice and replace as necessary. And don’t take anything for granted. When working on the front brakes of your car, don’t forget about the wheel bearings. In fact, give them serious consideration. The bearing should be packed with a non-fibrous, high temperature wheel bearing grease and the spindle should be lightly coated with the same grease. Bearing adjustment is critical too. If the bearing is too tight, the wheel will drag and premature bearing wear can be expected. If the bearing is too loose, the wheel will wobble and bearing wear will again be the result. Wheel wobble will cause both drag and suspension wear. When setting up wheel bearings, how tight is tight enough? According to General Motors, bearings should be adjusted for 0.001-0.005-inch endplay. That’s not exactly easy to measure. In order to reach that point, tighten the spindle nut while turning the wheel until the bearing is tight enough to cause the spinning wheel to slow down due to bearing drag. Loosen the nut and repeat the process several times. This will insure that there are no hidden burrs or nicks on either the spindle or the spindle nut. Finally, tighten the nut with your thumb and finger as snug as possible with the wheel turning. 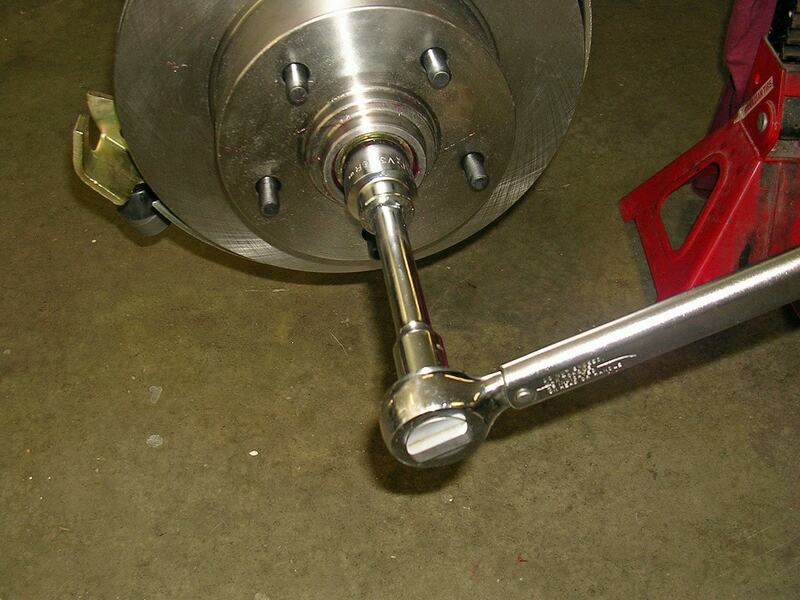 Next, use a torque wrench to verify how tight the bearing has become. Preload specifications vary from car to car, but typically the wheel bearing adjustment preload torque works out to 12 foot pounds on something like a first generation Camaro (as shown in this photo). Next, back off the nut just enough to allow the cotter key to be installed. If you have to back off the nut by almost 90 degrees to insert the cotter key (unlikely, but it sometimes happens), try swapping the hardened washer found under the cotter key with another. You might have to mix and match combinations to find the right washer. When this formula is interpreted, this is the amount of force exerted by your leg times the pedal ratio divided by the area of the brake system pistons. The typical adult male can exert approximately 300 pounds of force in one leg (maximum – as in an “I’m terrified” panic stop). Now, if you’ve ever tried single leg presses at a gym at 300 pounds, you’ll know that’s a lot! As a result, when you’re figuring out the right pedal ratio for your car, shoot for a number in the order of 1/3 or even ½ of that figure. It will, obviously, prove more comfortable to drive, even in a high performance application. FYI, the average manual (non-power boosted) master cylinder requires somewhere between 600 to 1,000 PSI to be totally effective. Somehow, you have to translate 100-150 pounds of leg force into 600-1,000 PSI. While changing the overall length of the pedal is possible, it's usually easier (and far more practical) to shorten the distance between the pivot point and the master cylinder pushrod mount location. And by the way, if you go overboard in the pedal ratio department, the brakes can become over-sensitive or touchy. Squealing, squeaking, squawking, noisy brakes are a real pain in the you-know-where. Not only is it annoying to you behind the wheel, it’s also embarrassing when you’re cruising around. Here’s an anti-squeal tip you might want to try: Once a rotor has been resurfaced, hand sand both sides smooth and flat using 120- or 150-grit sandpaper on a sanding block. After sanding, clean the rotor thoroughly with detergent and water (or brake cleaner). This serves to remove all the fine grit and dust that can cause the chatter. 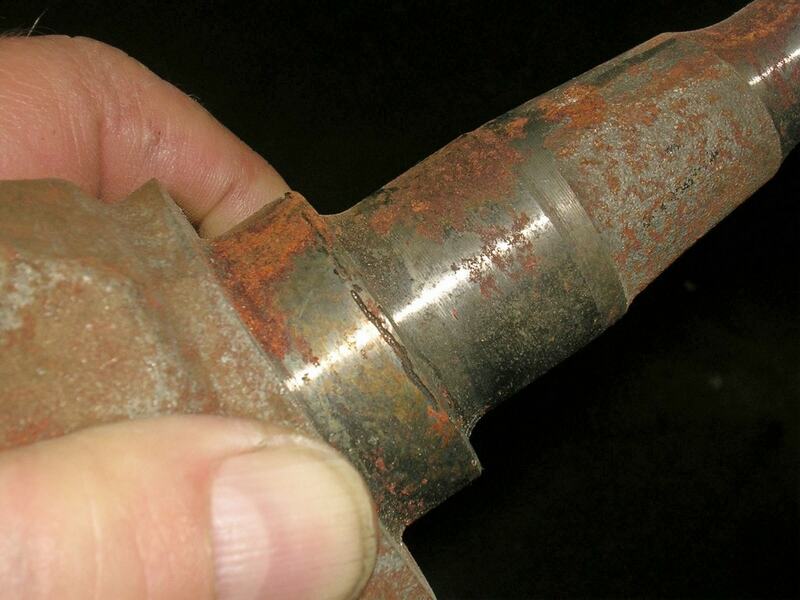 If you have a car with four wheel disc brakes and a master cylinder that is mounted somewhere under the floor (roughly 90% of street rods and almost all tube frame race cars fit this bill), keep this in mind: You’ll likely need a 2-PSI residual pressure valve in the line(s). These little valves are only required if the height of the brake calipers piston(s) are higher than the master cylinder. In this situation, brake fluid can run backwards from the caliper pistons to the master once the brakes are released. The dilemma is characterized by a pedal that requires pumping at least twice to gain some pedal feel. The solution is obvious: Plumb a residual pressure valve (or two) in line. They’re not expensive, they’re not bulky and they are available in various thread configurations so that plumbing is a breeze. When bleeding brakes the old fashioned way (with a helper in the car pumping the pedal), remember one critical fact: If the helper pumps the pedal rapidly, the big air bubbles in the system can be broken down into a whole bunch of smaller air bubbles. The result? A system that is harder to bleed. The solution here is to ensure that the person in charge of pedaling keeps the motion steady and relatively slow. 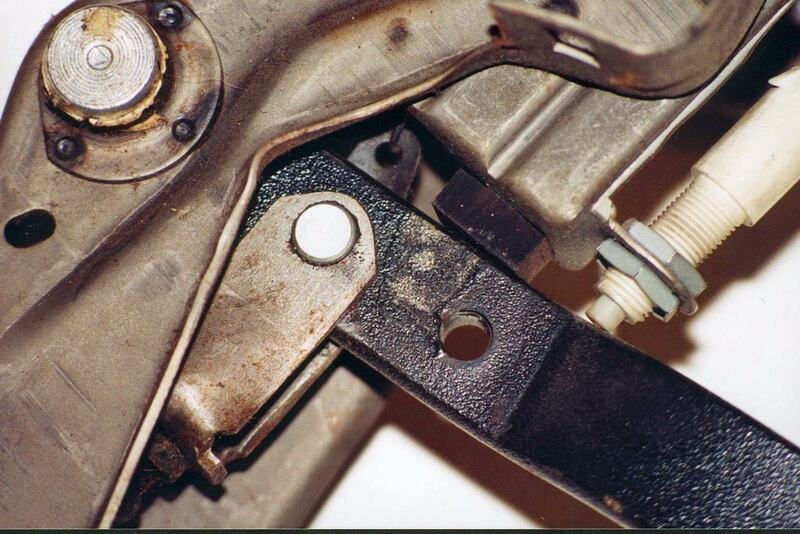 And by the way, when bleeding brakes manually, be careful not to overextend the master cylinder piston. This can rip or tear piston cup seals that in turn can result in master cylinder failure. To stop this potential problem, try putting a block of wood on the floor under the pedal while bleeding. It simply curtails the stroke. If you run into a tough bleeding job (for example, as laid out in the previous tip), try this: Use a good old fashioned turkey baster or a large syringe (the big disposable ones sold by your local veterinarian are perfect) to pump brake fluid backward through the system by way of the bleeder screw. Don’t laugh - it works when flushing bubbles out of their hiding spots. 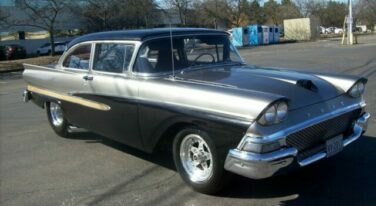 See the rubber brake hose in this photo? Take a close look at the hose. It has what appears to be a metal junction part way through the rubber hose. What’s that for? 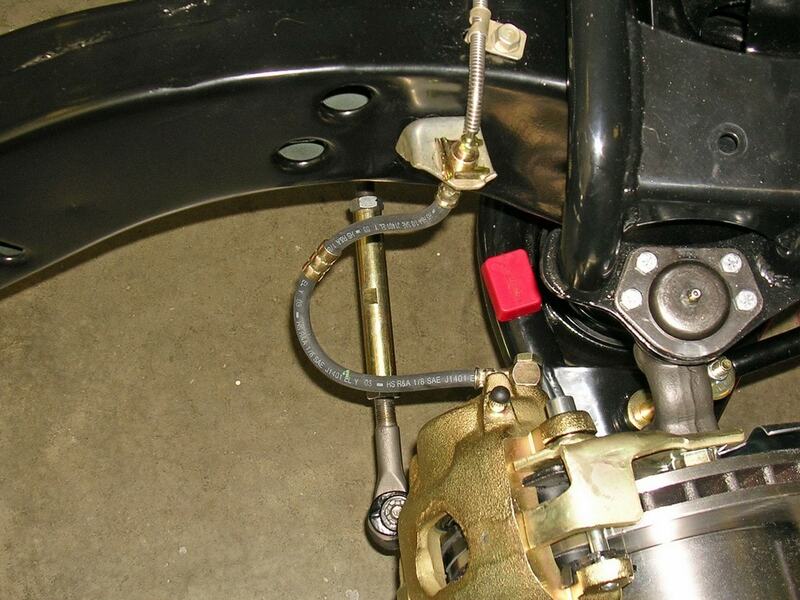 That is the location for a metal brake hose clip that attaches to the stock upper control arm. 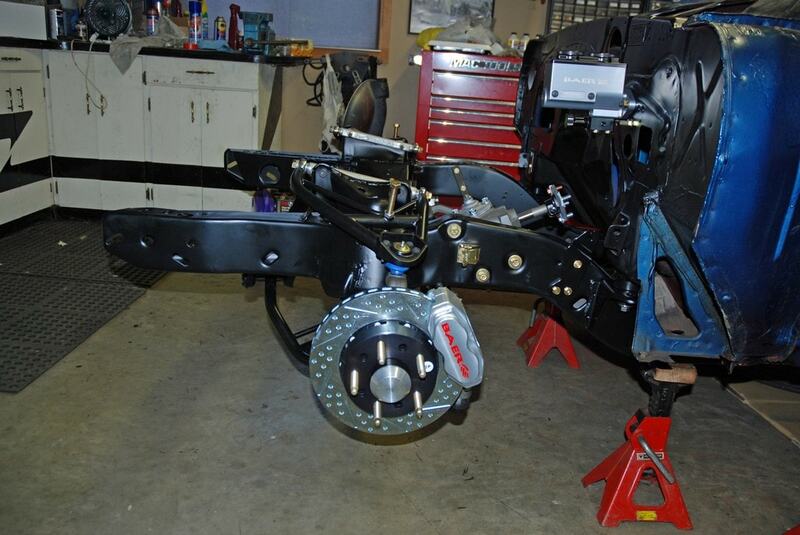 This particular front end was assembled with aftermarket control arms that do not have a provision for the clip. 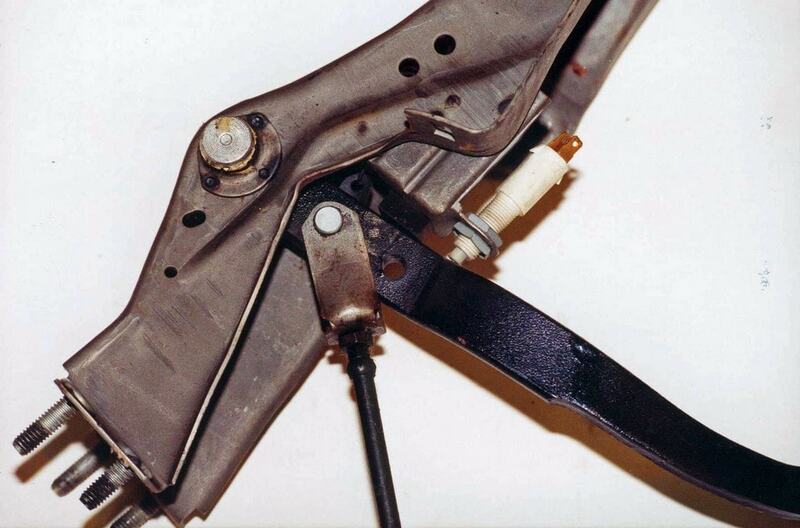 The original idea behind the clip (as used on stock, production cars) was to secure the hose to the control arm. As the suspension goes through its travel, the hose cannot rub against various bits, nor can it become pinched under certain turning and/or suspension movements. The bottom line here is, there should be a clip in place. In this case, we have to figure out a means to fasten the hose (at the metal clip location) to restrict unwanted hose movement. Look carefully at these brake bits (dust shield, caliper mounts, hardware). See the little parts in the photo? Nice, right? 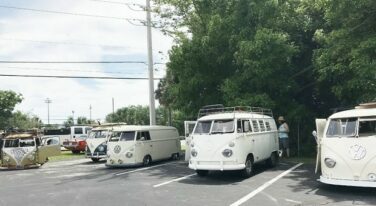 The parts in this first photo are perfect because they’re brand spanking new components from Stainless Steel Brakes Corp. Working with new hardware and new plated components is a pleasure. But what if you’re re-using old parts (as in the parts in the second photo)? Simple – have them stripped and re-plated. Not only have we done this with little hardware, we’ve done this in the past with caliper mount brackets and dust shields. 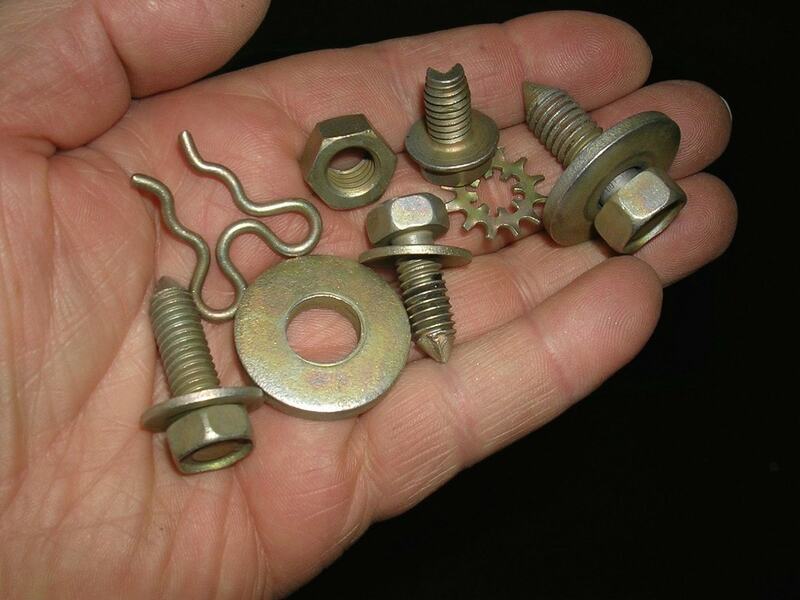 You can buy the special mount bracket bolt (the short stubby one) new, and the other hardware is simply high-grade fine thread hardware available from your local bolt supply house. Detailing this stuff isn’t expensive, and it sure beats working on filthy, beat up parts. 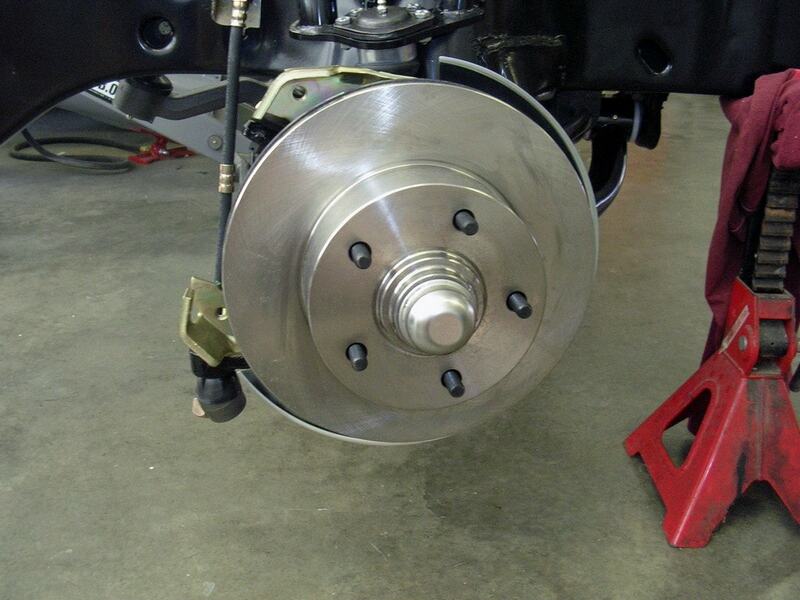 Everyone knows about directional rotors, but you should also be aware of caliper direction too. When installing calipers, be sure you have them on the correct side of the car. Unfortunately, both sides look similar. Which side is correct? The brake bleeder should point up instead of down. If the bleeder points down, then bleeding is, for all intents and purposes, impossible.